Networking can provide incredible opportunities for increased customer traffic. Social media platforms make it easier than ever before to get in contact with prospective customers and generate buzz, but resist the urge to bombard them with sales pitches. Being social, answering questions and concerns, and putting a human face to your company will make people more likely to make a purchase. Networking is also a great way to stay tapped into what competitors are doing, allowing you to adapt and get ahead of the curve. Always keep in mind who you are attempting to draw in with your business. Depending on the products you offer, you may have to factor in demographics such as age, gender, education, and income level in order to ensure that your advertising is as effective as possible. Your target audience can impact the way you advertise, as well–for instance, a younger target audience likely means that social media-based marketing will be more appropriate. Casting too wide or too narrow a net can severely limit your potential to draw in new customers. Whether it’s a referral code, a coupon, or even a free gift, promotions can dramatically increase new traffic. Customers are always looking for a great deal, and a well-timed promotion is often all it takes to entice someone into taking a closer look at your business. Special offers for first-time customers can be highly effective, while online-exclusive deals and deal-of-the-day websites such as Groupon also have the potential to bolster online business. A professionally designed website is often one of the wisest investments you can make. Remember that you only have one chance to make a first impression: customers who see an amateurish or difficult-to-navigate site will be put off and assume that the same quality standards extend to your product. An appealing site with well-written content will reflect highly on your product while making it easier for new customers to find you and do business. Customer feedback is an invaluable tool, whether it’s in the form of comments on your website, reviews, or surveys. An entrepreneur who is willing to listen to what customers want and adapt their products or services accordingly will have a major edge on the competition. Companies that demonstrate an ability to accommodate the desires of their customer base quickly earn a reputation that will draw in new customers eager to deal with an honest, responsive business. The key to attracting new prospects and turning them into repeat customers is to foster genuine relationships with them. Always strive to put people first: analyze the customer experience, seek feedback, and engage in a dialogue whenever the opportunity presents itself. Blogs and social media accounts allow a business to interact with potential customers in a casual, social setting. Treating people with respect and gratitude is one of the best ways to ensure that someone will not only seek to do business with you again, but also that they will refer you to friends and family. 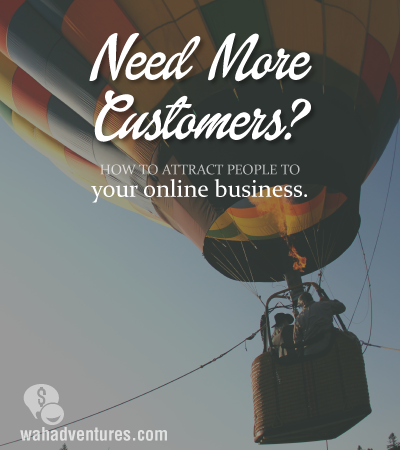 Attracting new customers is rarely easy, but it is a goal that every business owner must strive toward. While there is no guaranteed path to success, the strategies above represent the most effective means of drawing people to your business and getting them interested in your product or service. Hello! Thanks for your words of encouragement! Running an on-line business is not as easy as some people may believe.